A few weeks ago, I was talking to a friend about flight sims and learning what’s changed in a scene that I abandoned around the time I went to college. I got to reminiscing about the flight sims I’d fallen in love with, like Secret Weapons of the Luftwaffe, Red Baron, and the Jane’s series. Games that were smart enough to know that most of us who gravitated to combat flight sims weren’t having daydreams about managing arcane avionics and reading 15 pages on cold-starting an engine. “What happened to all the people that just loved dogfighting?” I asked, wistfully. “Well, a lot of them play War Thunder now,” he told me. Having just spent a week in glorious combat among the clouds, I can see why. I just want to fly an aircraft into combat. Most flight sims seem to build a moat around what I want. The good stuff is behind an awful lot of ground school and frustrating trial-and-error. But War Thunder lets me choose my own level of involvement and, more importantly, doesn’t seem to judge me for taking it easy on myself. So my first experience with War Thunder, once I got my flight stick and throttle set up, along with the TrackIR that follows my head movement was pretty much a dream come true. 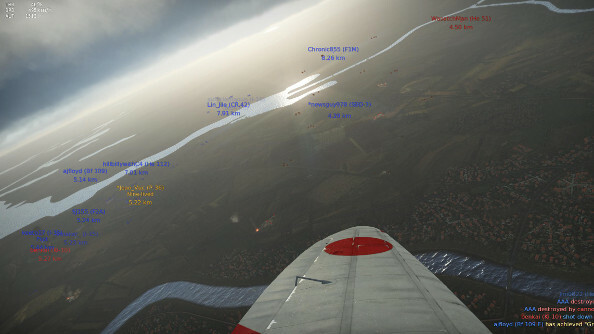 I was flying a Kawasaki biplane over a hazy European battlefield. I could hear the wind rushing over the open cockpit. To my right, the sunlight glinted off a river, turning it into a brilliant silver ribbon running through a carpet of green forest. In the distance, I could make out flashes of gunfire and puffs of smoke and dirt on a battlefield. And just like that, I was transported. I touched the stick gently to the left, saw my avatar mimic the move, and the plane lurched. I got that same feeling in the pit of my stomach that I get during a rough take-off. But this time, I was in complete control of it. I eased back on the throttle, filling my ears with the racket of my little engine, and lifted higher into the sky. I glanced over my left shoulder (it’s amazing how quickly you get used to the movement-amplification of the TrackIR) and saw my teammates streak past below in their motley assortment of pre-World War II aircraft. 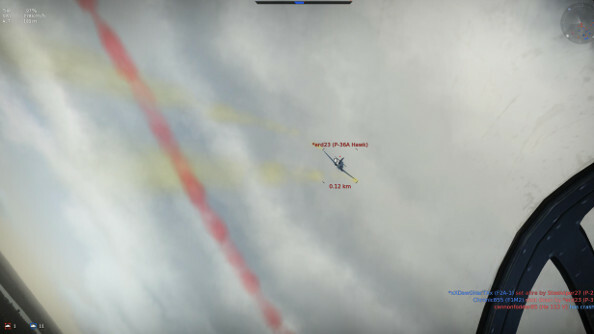 I had gained about 600 meters before I spotted the enemy and leveled off to gain airspeed. I was just kissing the bottom layer of the clouds, and beads of condensation were whipping over the top wing. I watched through the haze as my teammates, most of them newbies like myself, went diving after the lead enemy aircraft in a race for the first kill. I watched it all happen over the side of my cockpit. Then, everyone committed to the dogfight and the first casualties were announced via distant explosions. Pieces of broken plane fluttered to earth like scraps of paper. I decided my moment had arrived. I picked a target below, heeled the plane over on its left side, and dived. I felt like the Red goddamn Baron. About ninety seconds later someone shot me down. I have never been happier in a flight sim. The thing about War Thunder is that it has an arcade mode and a realism mode, and yet the arcade mode never feels condescending or unconvincing. It’s forgiving, certainly. You can abuse a plane more than you could in real-life, putting irresponsible amounts of strain on the airframe. You can also mix it up in combat as much as you want. Run through all your ammo? It’ll reload in a few seconds, don’t worry about it. But outside of that, the feeling of flying an aircraft remains authentic. Pull a crazy maneuver and you’ll feel the aircraft starting to become a victim of physics rather than their master. Come down too fast on a target and you’ll watch helplessly as he barrel-rolls out of your way, sending you overshooting the mark and straight into his gunsights. World of Warplanes can never get this right. It’s not in its DNA. You have to fight with the control settings to get planes to behave like their real-life counterparts, and it takes even longer to find the right mix of settings that will let you do the cool stuff that planes can do without being at a disadvantage against the people using the idiot-proofed default controls. And because everyone plays together, no matter their settings, it can never really embrace the possibilities of more realistic physics. 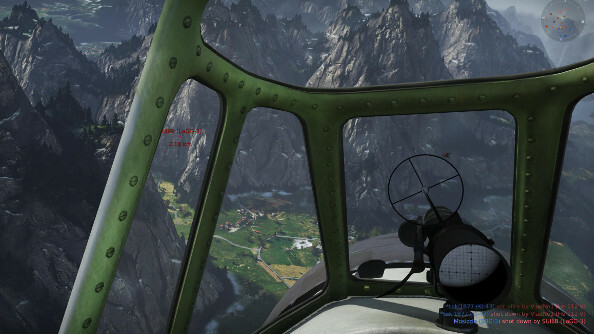 It’s quite a lot of fun, but it will always be a plane-themed shooter more than a game about planes. 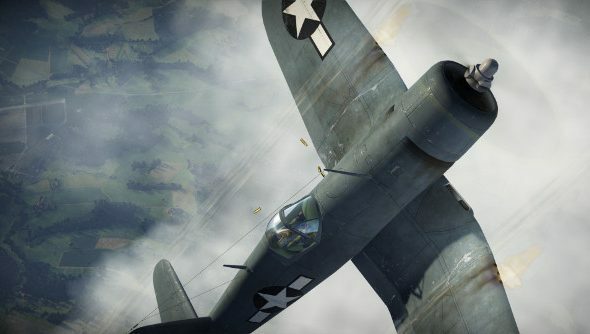 War Thunder lets the greenest of novices have the feeling of true flight, while more demanding players (and freshly-minted veterans) can go to realism mode, with its promise of more mission variety and realistic World War 2 scenarios. I’m not quite there yet, as I’m having far too much fun just blasting around in arcade mode (whose wait times for a mission are less than half of what you’ll find in World of Warplanes, by the way). But I look forward to making dive-bombing runs on American carriers and knocking Heinkels out of the sky above England. Do you remember the first time you played a modern Battlefield game and realized, “Holy smokes, this is just like being in a war movie?” For me it was probably Bad Company 2 that made me realize how much multiplayer shooters had changed since I last paid attention to them. I was taking part in something that looked dazzlingly real and beautiful, and every single person in the battle was another human being. And it was smooth and stable, performing just as well as single-player, when you came down to it. I think War Thunder is that game for air combat. It looks as good as any flight sim I’ve ever played, but it removes every single technical or practical barrier to playing them alone or with other people. You don’t have to find a group of like-minded aviation enthusiasts on a message board and join their virtual squadron. You don’t have to spring for a new game. You don’t have to choose between realism or accessibility. You just download it, choose how you want to play, and then you’re flying. I kept waiting for the free-to-play shoe to drop, but it never did. Our own Paul Dean did a wonderful job laying out the basics when War Thunder first emerged on the scene and I don’t have much to add. His fears about pay-to-win don’t seem to have materialized, and the value offered in exchange for your time is every bit as generous as he made it out to be. I plan on throwing some money at War Thunder as soon as I know I can commit some quality time to it, just to open up some more options, but I seem to be advancing at a decent pace through the tech tree. Not that I’m in a hurry, because the journey is so enjoyable that I’m not even worried about the destination. It’s a good thing, too, because the one complaint I’d level at War Thunder is that its tech tree and economy are not terribly well-explained. In this one area, it lags far, far behind World of Warplanes. Instead of the satisfying feeling of getting a long-awaited unlock, each upgrade and new plane feels like discovering an old $20 bill in the pocket of a freshly-washed pair of pants. You’re happy to have it, but you’ve no idea where it came from. But all of that is just wrapping paper around what might be the most accessible and entertaining flight sim since… European Air War? Or maybe we have to go back even farther, to the LucasArts games? It’s hard to be sure, through so many rose-tinted memories. All I know is, War Thunder is a cool drink of water to the casual fighter pilot that’s been dying of thirst these last fifteen years.